When you using Windows Authentication (NTLM + AD) with your sharepoint site you may want to enter credential after you sign out from your site.But it is not easy and somehow imposible when using authentication NTLM and IE .Beacuse after you sign out and try to login again ,automatic login proccess logs you in immediately. I can explain you two alternative way two prevent automatic log on. First solution which is my suggested way. Dont use windows authentication . Use Claim Based Authentication (CBA)+ (Forms Based Authentication) FBA with Active Directory (AD) membership. //This code added for testing jquery working correctly. And be sure your site not added to trusted zone sites. Try again to login and see asking your credentials. 1) First complete solution above and test its working. 3) Add an alternet access mapping as “www.testsignout.com” from Central Administration site. 4) If you dont want to add a dns record like me append this url to your client machine host file where you want to test your sign out process. 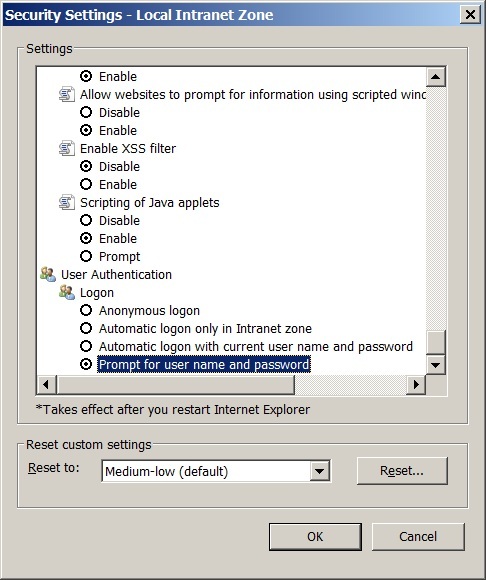 See default action for IE as Internet zone asking to you your credentials. If you have already running UPA and have correct sync connection than after changed NetBIOSDomainNamesEnabled true and already get full import but domain names still FQDN name instead of Netbios names. 1) Check AD Replication Directory Changes Permission is set correctly . 2) Clear all syncronization connections. # To get the GUID of the User Profile Service Application run Get-SPServiceApplication. 5) Reset OWSTimer and complete iisreset. Important !!! : this script not work with Domain Administrator’s accounts . Write-Warning "Permission '$permission' not found." $replicationPermissionName = "Replicating Directory Changes"
It must have Replicate Directory Changes permission on the domain that you will synchronize with. See Grant Replicate Directory Changes permission on a domain for instructions to grant this permission. If the domain controller is running Windows Server 2003, the synchronization account must be a member of the Pre-Windows 2000 Compatible Access built-in group. See Add an account to the Pre-Windows 2000 Compatible Access group for instructions to grant this permission. If the NetBIOS name of the domain differs from the domain name, the synchronization account must have Replicate Directory Changes permission on the cn=configuration container. See Grant Replicate Directory Changes permission on the cn=configuration container for instructions to grant this permission. If you will export property values from SharePoint Server to AD DS, the synchronization account must have Create Child Objects (this object and all descendants) and Write All Properties (this object and all descendants) permissions on the organizational unit (OU) that you are synchronizing with. See Grant Create Child Objects and Write permission for instructions to grant this permission. #The scripts is distributet "as-is." Use it on your own risk. The author give no warranties, guarantees or conditions. write-host "Profile for account ", $AccountName, " has been removed"
#Do not delete setup (admin) account from user profiles. User Profile Application Service not getting correctly domain\username when NetBIOS anb FQDN names different. First you think like me should i missing a parameter ? Answer NO! You are not! this fuction is parameterless.But whats happing ? I reflect the dlls and find out SPContentDatabase.RemoteBlobSettings.Enable() function call stored procedure of “dbo.proc_EnableRbs” in selected content database.And this stored procedure using @RBsId as internal parameter. After working one day and countless install/uninstall attempt finally we found the problem is SQL Server Collation set “TURKISH_CI_AS” .And sharepoint 2010 has limitation with SQL collation . Changing the server collation to Latin1_General_CI_AS_KS_WS fixes the issue . In this moment you have two option as hardway you can try to rebuild master tables with correct collation and alter all content databases or as easy way you can reinstall SQL Server with corrent collation.